Finally I get to the useful information that I wanted in the first place! The map is correct - that is the stop I wanted all along. I can change the number of buses I want to check on by using the Lines Displayed option if I want to. 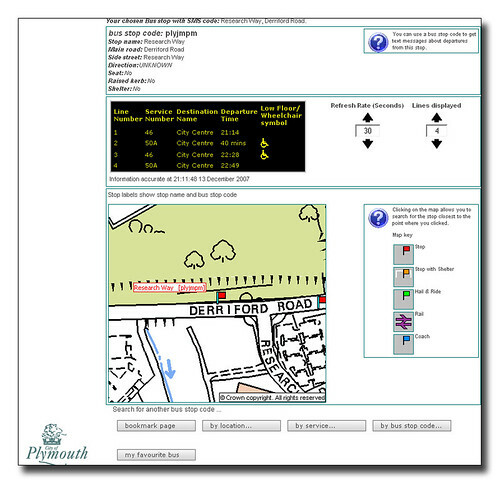 Now according to the City Council Help section the display in black box simulates what would appear on the real time display at the bus stop - if it had one. According to the council Firstly, a bus on the real time system which is less than 20 minutes away will show its departure time as a countdown in minutes. If the bus is more than 20 minutes away or not on the real time system. As I type this up, the bus shown as due at 21:14 has just passed my house - and it was a non low floor Dart. 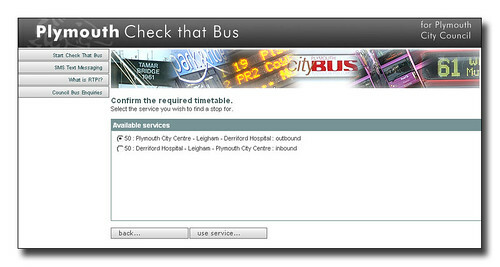 I guess from the help text it means that this bus did not have real time monitoring equipment fitted as otherwise it would have displayed the number of minutes left. Also I note that the next bus is displayed in minutes even though the departure is more than 20 minutes away. One good feature is the 'book mark this page' which adds a book mark to your Explorer which means you can go straight to the bus stop you want. I now have the Tamar Science Park bus stop (Research Way as I am supposed to call it) set up on my PC at work. At home I now have the local stops on Keswick crescent in both directions. This is a real time saver and could be made more obvious on the web site as a feature. 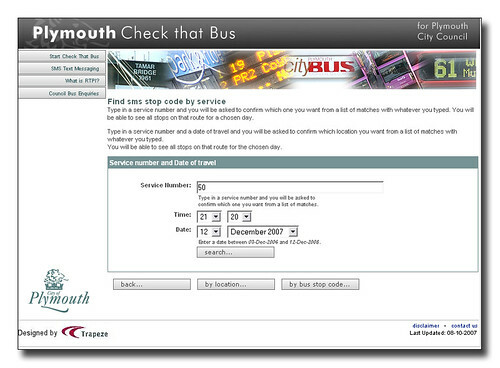 I have also tried the text sms service when I found out the bus stop code for Research Way and it was fairly accurate. It did not show the bus I caught - but then it was a duplicate service so I guess that's fair enough really. Also, as the first stop after Derriford Hospital - itself one of the major bottle necks, a bus could well be shown as leaving on time, and take ten minutes trying to leave the site! All in all this has a lot of potential once things have settled down. Even tonight where I have at last managed to get some information out, the system has errored out three times. 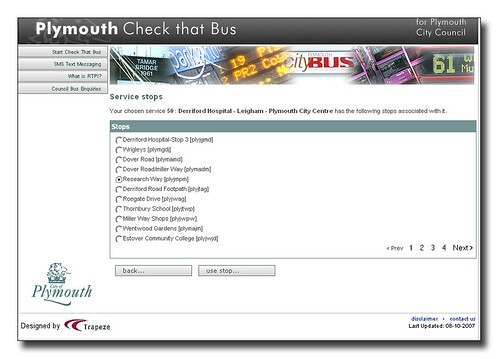 Once you get a location set up on your computer and saved then your next bus is indeed just one click away. Getting that initial bus stop set up can be a real pain if you dont know what the council have decided to call the bus stop. Its a real shame that the council have decided to make the whole web site to fit the same dull design as the rest of the city council site. It would make much more sense to go for a brighter, easier design just for this service and really make a useful web site that could easily incorporate decent maps and other useful information. Less corporate image - more design and functionality. The poor mapping is a real hindrance though. As an avid user of both Google Maps and Microsoft etc I am used to decent well produced maps that can be moved around and zoomed in and out of to find your location. It seems that the council, like many others is stuck with what looks like the Ordanance Survey mapping service which is light years behind its rivals and a lot more restrictive. The fact that as tax payers we are all paying for this service and yet cant make use of it is a whole issue on its own (not for this blog!) Many councils are cutting loose and starting to go with Google and the others. 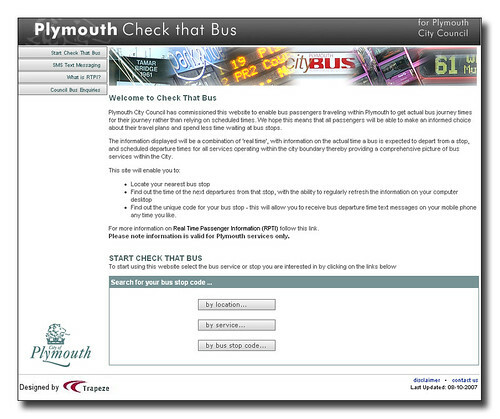 With this step, and just a bit of effort by the designers this web service could be a really useful tool to both serve the bus passengers and promote the local services.